This walking tour begins at the corner of Temple and Hill Streets near the Metro Red Line Civic Center Station. From the intersection, head west on Temple toward Grand Avenue. To the right is the fortress-like Cathedral of Our Lady of the Angels. Designed by Pritzker Prize-winning architect José Rafael Moneo, the building welcomes visitors looking to experience its unique architectural style, its solemn spirituality and its impressive artistic flourishes. Spend some time exploring one of the world’s largest cathedrals and then continue west on Temple to Grand Avenue. Turn left on Grand Avenue. 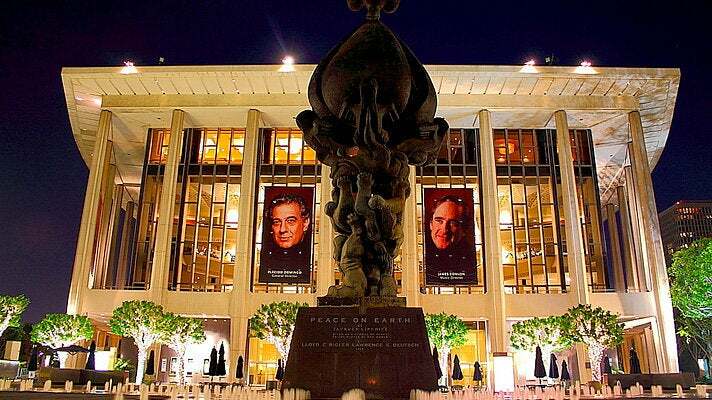 Here, you’ll discover one of the crown jewels of LA’s cultural scene, the Music Center. Home to some of the most important performing arts venues on the West Coast, including the Ahmanson Theatre, Mark Taper Forum, Dorothy Chandler Pavilion (venue for the Los Angeles Opera) and Walt Disney Concert Hall, the Music Center is a great place to spend some time, no matter what time of day you’re visiting. Continue south on Grand Avenue. On the corner of Grand and First is Frank Gehry’s iconic Walt Disney Concert Hall. When it opened in 2003, the building became an instant classic, providing a world-class venue for the Los Angeles Philharmonic and the Los Angeles Master Chorale. The building offers guided and self-guided audio tours, so be sure to sign up for one of these to get full exposure to one of the most recognizable buildings in LA. Next up is the Museum of Contemporary Art (MOCA), on the east side of Grand Avenue, just south of the Colburn School. Home to a surprising and breathtaking range of contemporary art, MOCA’s main location is one of LA’s hidden gems, a collection of more than 5,000 works created in the second half of the 20th century. The permanent collection boasts works by giants of art such as David Hockney, Jasper Johns, Roy Lichtenstein, Jackson Pollock, Robert Rauschenberg and Mark Rothko.